Through the ReSurfaced® program, City Collaborative and our partners continue to activate and experiment with the three-quarter acre lot in the Phoenix Hill Neighborhood just south of NuLu for 2017. We spent last year prototyping ideas, building infrastructure and Liberty Field (a 5-A-Side soccer pitch) all while bringing people together. Experimentation continues in 2017 with the addition of new features, new programming, and community demonstration projects. Our goal is to create a space where people from around the community can come to engage, collaborate, educate, create, and celebrate. Now that we have taken the underutilized space and created a functional place, we are looking to work with a variety of interested groups and businesses to activate the space and create unique experiences. See below for our evolving calendar of events and how to get involved. This year we will be focused on creating unique experiences, so rather than one long activation of the space, ReSurfaced® will be strategically programmed for two-three day events. Our aim is to primarily program the space on the first and third Friday and Saturday weekends of each month. The space may be activated with other special events at different times and the soccer field will be continually operational, so check the upcoming events and calendar often. We continue to refine the space for 2017. The following are some of the major features of ReSurfaced® for 2017. Anchored by Cooper's Craft new bar and retail shipping container spaces, enjoy sitting outside in beautiful Louisville weather in a unique pop-up gathering space, whether you are getting together with friends after work or dropping by for specially programmed events. Liberty Field, our ReSurfaced® 5-A-Side soccer pitch as been active since the turf was complete. We are hoping to bring what we learned from this prototype to other parts of our community. For more information on how to participate and get involved in ReSurfaced Soccer click here! The double-stacked shipping containers are not just for having a birds-eye view of the action below, the interior space is designed to provide opportunities for curated exhibits. We will be working with local organizations to help facilitate our communities creativity. As a non-profit, City Collaborative relies on partners and sponsors to help make creative placemaking projects like ReSurfaced possible and accessible to the widest community. Our focus on experimenting and developing low-cost, high-impact initiatives to improve our city cost money, time and resources. We are so thankful for our sponsors and partners. If you or your organization is interested in supporting ReSurfaced, specific programming, experimental initiatives, or for more information about getting involved, contact our director, Patrick Piuma. Thanks to our Major Sponsors for making the space possible! We are also very proud to announce the support of Brown-Forman and their latest bourbon addition “Coopers' Craft." Brown-Forman is a staple in this community. Their early support of ReSurfaced® helped make the site a reality and their new bar and retail spaces are a welcome addition to this space activation. 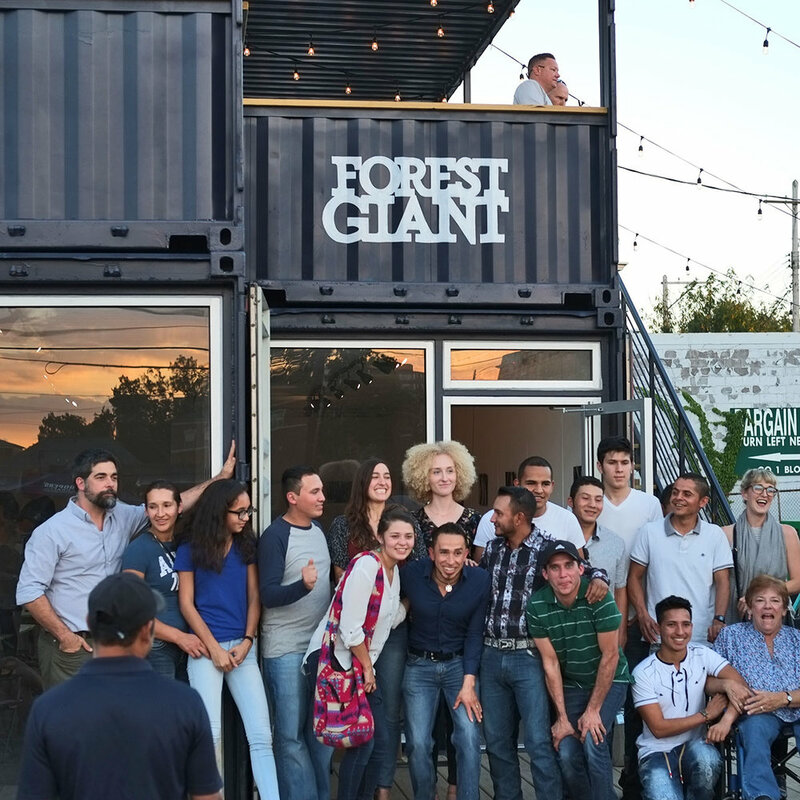 Forest Giant's commitment to the community shines in their double-decker container unit for this iteration of Resurfaced®. The container serves as a community workshop center and art gallery space, building on our goal to provide a place for collaboration, creativity and exploration. Heine Brothers Coffee has been a Louisville main-stay since the early 1990's. Their pioneering coffee houses, commitment to the community, and support for entrepreneurialism makes them a great addition to ReSurfaced: The Liberty Build.